With an enthusiasm that brings tears to the eyes of graying hackers everywhere, American teenagers are disdaining low signal-to-noise ratio "rich media" sharing and are embracing ASCII (that's American Standard Code for Information Interchange) text instead. Who needs those acoustic-telegraphy-based "tele-phones" anyway? According to a Pew Internet and American Life project, US teenagers prefer ASCII text to all other communication forms, including phone calls, social networks and even f2f (that's slang for "face-to-face" for all you scientifiction fans). One-third of American teenagers send at least 100 texts per day; the ratio of ASCII text acceptance is even larger if you include email and instant messaging. Text messaging has become the primary way that teens reach their friends, surpassing face-to-face contact, email, instant messaging and voice calling as the go-to daily communication tool for this age group. The telephone device, which may be used in "transmitting over wires many articulated sentences" (according to Thomas Edison), is used primarily for communication with old people, like their parents, according to the teens interviewed for the study. Ah, youth! I don't have the heart to tell my children that, when I was a teenager, I also preferred to use ASCII text to communicate. "I have also approved recommendations of the Secretary of Commerce regarding standards for recording the Standard Code for Information Interchange on magnetic tapes and paper tapes when they are used in computer operations. All computers and related equipment configurations brought into the Federal Government inventory on and after July 1, 1969, must have the capability to use the Standard Code for Information Interchange and the formats prescribed by the magnetic tape and paper tape standards when these media are used." 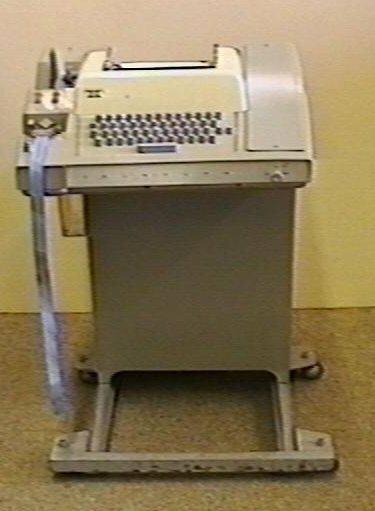 My first introduction to ASCII occurred while using the Teletypes that were the standard way to program remote computers in 1969 (see below). From Teens and Mobile Phones.